Coolvin Lodge represents an outstanding opportunity for the discerning purchaser who is looking for a high standard suburban home. 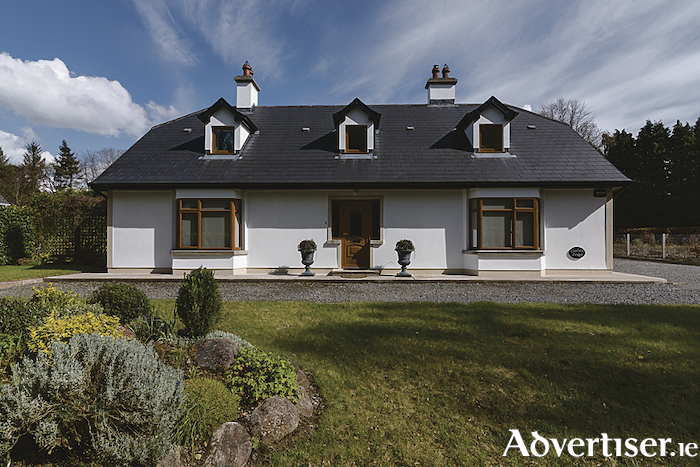 Located just 7km from Athlone and within walking distance of Hodson Bay and Lough Ree, this fine home on a private avenue permeates tranquility and elegance. Featuring four fine reception areas, the living/dining and sunroom afford views of the home’s beautiful landscaped gardens, while a covered patio area provides an exceptional venue for alfresco dining and for enjoying the splendour of the home’s surroundings. The house measures more than 2,600 square feet and stands on approximately half an acre, with a detached garage. There is ample car parking to front side and rear. The interior offers four bedrooms, three reception rooms, four bathrooms, a sunroom, central heating and good decor. The home enjoys a BER C1 rating. This property also features a number of attractive extras, including: Underground cabling in place to enable a connection for electric gates; a well in the garden for a future water feature; a house alarm; smart home wiring; water softener; underfloor heating downstairs; emergency lighting on two floors; solid oak doors, skirting and architraves; marble fireplaces; a professionally designed garden with colour all year round.